We Poetic Pilgrimage, we stand for peace, justice and equality. We’re anti-bloodshed, anti-violence and we say no more war. greed and corruption. No more, no more war. No more no more war. and the righteous arise, use light to reverse the effects of Satan’s curse. It’s getting worse on this earth, its ocean bank’s burst, famine and drought, hunger and thirst. For the last will be first, out of nations dispersed. Diverse as stars, in this universe. Perverse men disturb the humble who preserve Allah’s majestic words and so are visual firm. I spit this verse from the wings of birds, sprint with buffalo herds to get my voice heard. they no say play say judgment day aint far away. The wicked dance upon the graves of the innocently slayed under the anti-terror masquerade. But still we pray, five times a day, and still we pray, five times a day. In this world so consumed with vanity, I’m trying to find an ounce of sanity. Keep my steps in tune with the sighting of the moon, the rising of the sun. That’s how the west was won, I see stars in the horizon, clouds with silver lining, my soul’s redefining. I spit skylines, push up peace signs in crews on front lines. in the midst of this paradigm. I’m just reaching my prime, my optimus, no games, no fables, no lead tables, trying to live my life stable. This ain’t no stakeholdiing shares on my soul, nor for fame or for gold. Shoot aim and offload, this time was foretold by wise men who were bold. So we stay composed as the story unfolds. Oh behold, as the story unfolds, fold, fold. greed and corruption. No more, no more war. No more, no more war. Love, light, honesty, modesty, self respect. Love each other the same way you’d love your mother and pray for brighter days. Pray for a new tomorrow, pray for peace, pray for peace. Poetic Pilgrimage are an exciting female Hip Hop and spoken word duo from the UK who are set to take the world by storm with their unique sound, intelligent lyrics and unparalleled charisma. They are a rare act, being one of the few Muslim female outfits around and are unafraid to express themselves through the art of rhyme. The group has toured all over Europe and the United States and have performed alongside artists such as Talib Kweli from the USA, K’naan from Somalia and Mutabaruka from Jamaica. They have received critical acclaim and press coverage from many of Europe’s most notable publications. 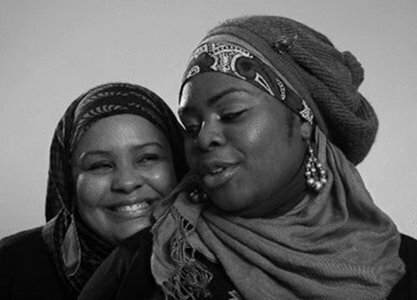 Whether helping youth learn to write heartfelt poetry, or rapping at the most male-dominated Hip Hop venues, Poetic Pilgrimage has become one of the most well-known and well-respected Muslim hip-hop crews in the world.